Hello everyone, we hope you had a restful Columbus Day! We are back here at Chart Chums after spending some time with family and friends, and ready to think more with you about everyone’s favorite topic: charts and tools to help make independent readers and writers! This week’s post involves one of our favorite activities- checking out classrooms! Today we are going to look at what Ivy Cole, a very generous second grade teacher at PS 109 in the Bronx, has been working on to create an environment designed to energize and excite her children about reading and the reading workshop. Below are some pictures from her classroom. We think you, like us, will be blown away by the highly engaging charts and how clearly they support the teaching of reading. This is Ivy’s interest library. 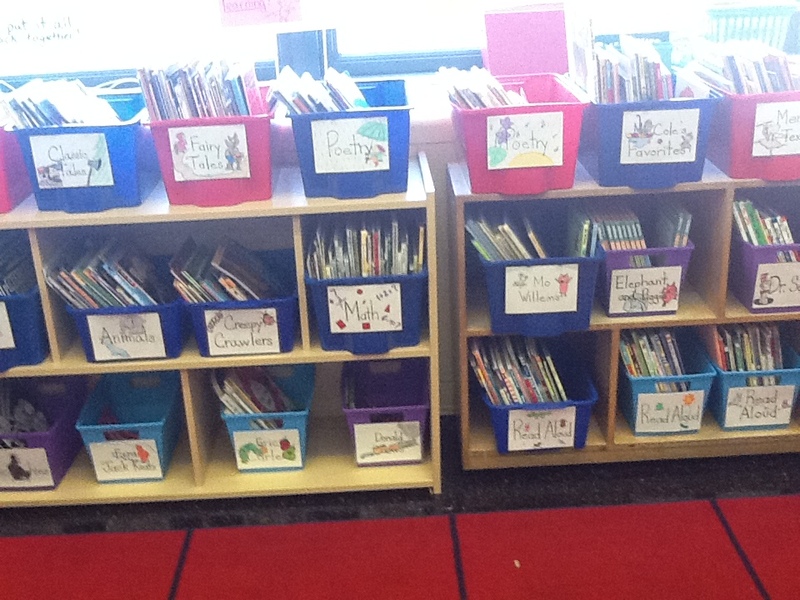 The bins have both a title and a picture to support all readers in finding the books they want to read. This is Ivy’s “Just Right” library. You can see she has readers ranging from levels E-N. It is divided into fiction and non-fiction. It is clearly labeled and attractive which invites children to shop independently. All of Ivy’s charts are hanging above her classroom library. 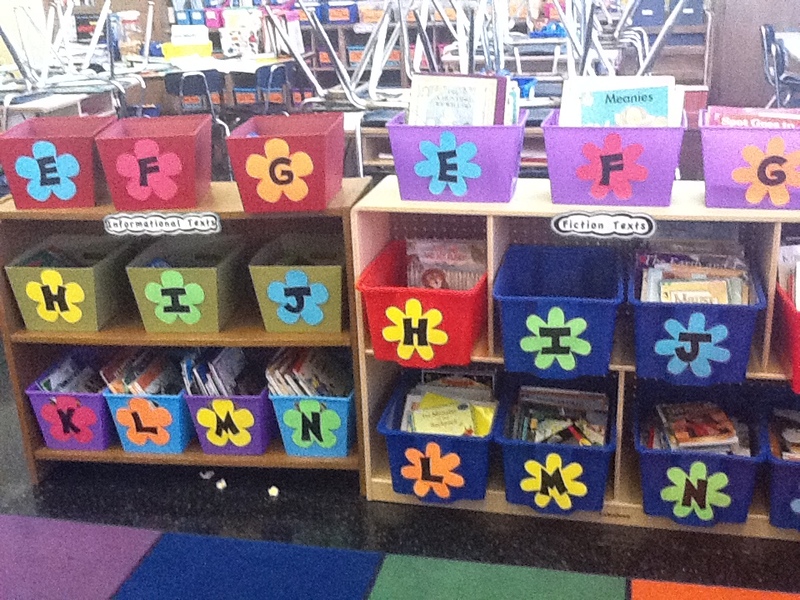 This is a great support and similar to the classroom we showed earlier in the Classroom Makeover post. This chart uses images from a book read with the class: Yo! Yes? By Chris Raschka. 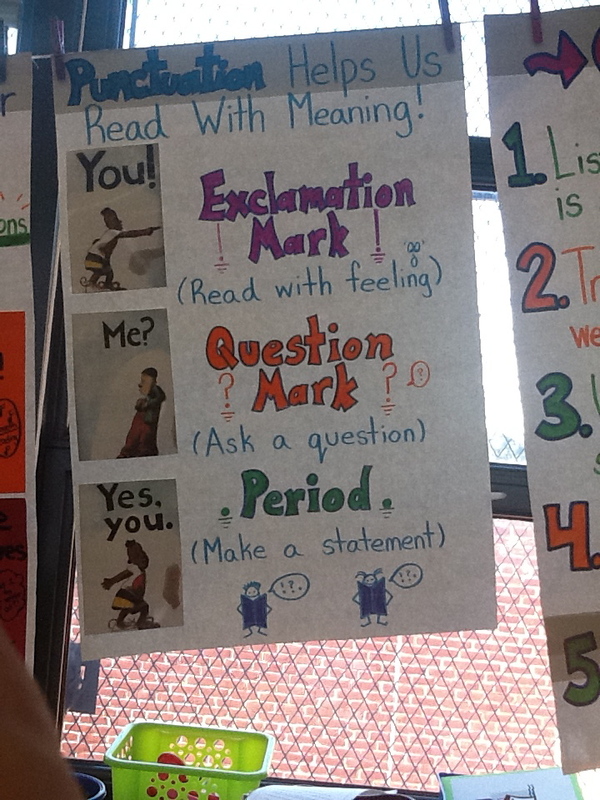 The use of a read aloud text as the visual makes the chart more memorable and user friendly. 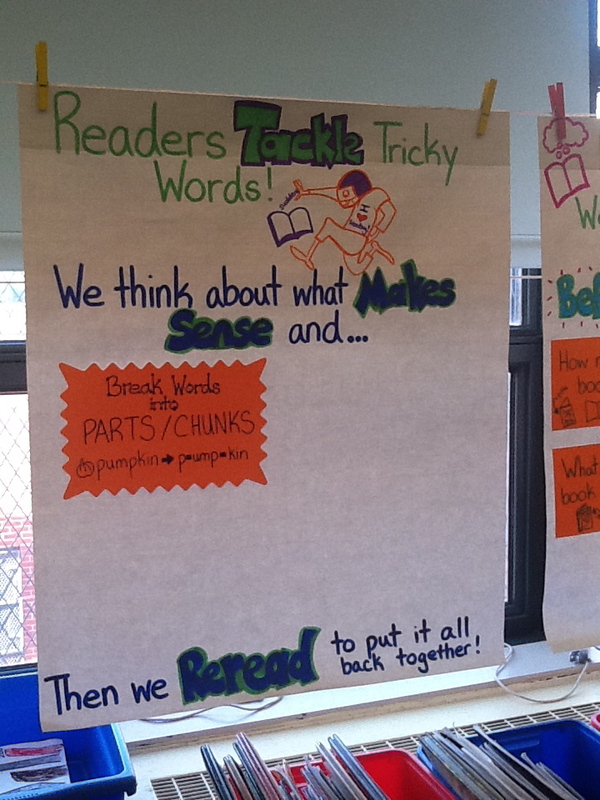 In your own charts, consider a read aloud that can serve as a concrete visual reminder of what you want your children to try and do as they read on their own. Photocopying some actual excerpts from a familiar text provides a context that gives meaning to what is being taught. Next up we see Ivy’s partnership chart. You can see clearly what goals she has for her students. 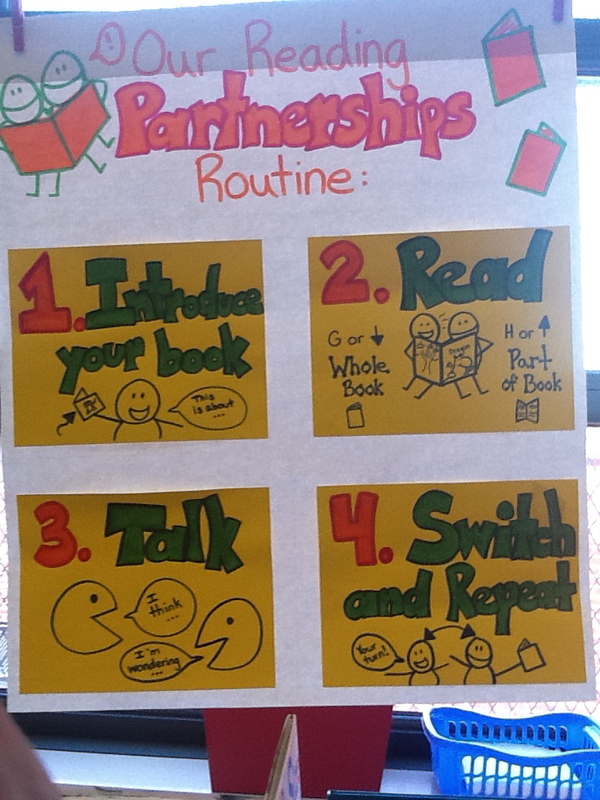 Fluency is one, as seen above, but also the routines of partnership time and how partners can organize their time together. It is clear and engaging, and the use of color makes certain elements stand out for children, like the order of the steps. In your own charts, think about using color purposefully to identify key ideas. Ivy is also working on teaching children how to tackle tricky words, using a favorite fall football metaphor to bring home this idea. You can see by the placement of the one post-it affixed to the chart that this will be a chart that is added to as additional strategies are taught. The message is that this work is still growing in the classroom. Two charts that were made earlier in the unit hang off to the side, and the one that she is now growing as she teaches is front and center. As you create your own charts, think about which ones will grow over time, and how you will manage the addition of new teaching. Ivy uses large post-its (As seen on the earlier post: Shopping the Specials), but the restickable glue stick works just as well! Thanks to Ivy for letting us show off her room, and serving as an inspiration to teachers everywhere! I am always inspired by other teachers. Go for it!